Each oral presentation is limited to 20 minutes including questions and answers (Q&As). Length of presentation material should be commensurate with the allocated time. You are requested to load your PowerPoint presentation materials before the session starts. The computers in the meeting rooms are being provided to Windows-based PC users. The PC will be configured with Microsoft Windows operating system as well as with Microsoft Office. We recommend you bring at least 2 copies of your presentation to the meeting in case there is a problem with one of them. Thumb Drive and hard disk are accepted. 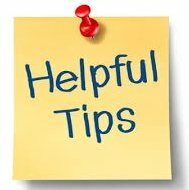 § Be considerate of the other speakers and audience by staying within your allocated time. The allocated time for your presentation includes a discussion and changeover to the next speaker. Session Chairs will hold you to the allotted time. This is essential to ensure adequate time for questions and discussion as well as adherence to the schedule. Poster sessions will be held at the Exhibition Area at Level 3. Please register at the Registration Desk before proceeding to locate your assigned poster board. To locate your assigned poster board, look for the board marked with your Paper ID. · Each presenter is provided with a 2.4 meter high by 1 meter wide poster board. · The presentation must cover the same material as the paper. · Place the title of your paper and your paper number prominently at the top of the poster to allow viewers to identify your paper easily. Indicate 1) the paper's identification number, 2) title, and 3) authors' names. · Highlight the authors' names, e-mail and address information in case the viewer is interested in contacting you for more information. · You have complete freedom in displaying your information in figures, tables, text, photographs, etc in the poster. · Include the background of your research followed by results and conclusions. A successful poster presentation depends on how well you convey information to an interested audience. · Please make sure that your paper number is clearly visible on your poster board. · Presenters are required to be at their posters during their scheduled Open forum session. · Tapes and other materials are available at the Information Desk, nearby the poster boards. Posters must be removed after the respective Open Forum sessions within half an hour. Posters remaining after these times will be removed. APEMC organizer will not be responsible for posters and materials left on poster boards after the stated hours. Staff at the Information Desk will be available to assist you with location and other on-site needs. Tapes and scissors will be available for your use. If you have special needs for your poster presentation, please bring those supplies with you to the meeting. There is no fixed formula for a successful and impressive presentation. 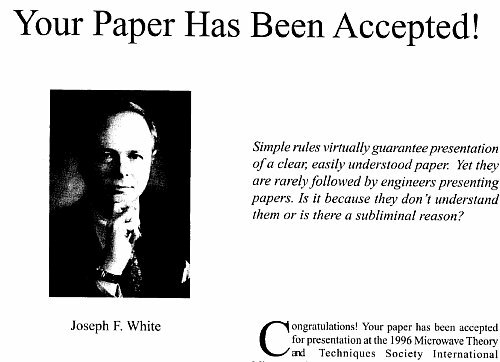 But the following advice, from Joseph F. White given to the 1996 IMS conference paper presenters, does contain some good deposite of gold. Click the picture below to download and read the PDF file.